Prior to 1938, colloidal silver was used as a mainstream antibiotic treatment administered effectively in just about every way modern drugs are used today: oral use, intravenous, intra-muscular injection, throat gargle, douche, topical and as eye drops. Production methods became costly during the depression. This motivated the pharmaceutical industry to create lower cost antibiotic products causing this amazing, more natural healing method to be replaced by more toxic, and potentially dangerous drugs. Colloidal silver is still considered to be one of the most universal antibiotic alternative and it is used worldwide in many modern applications today. Physicians still use silver compounds in 70% of all burn centers in the United States. 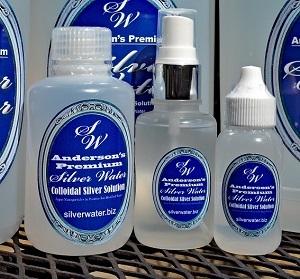 Silver Water is packaged in ways we feel are the easy for our customers to use. Buying the larger size is the most economical and eco-friendly way to use our product. However, we have found even small amounts usually rid the body of acute problems, addresses inflammation and chronic problems. Our Colloidal Silver is bottled with efficiency and easy use in mind, in drops, sprays and bottles. How Does Silver Water Work? To maintain health, our bodies are constantly working to be in balance. Diseased cells are not balanced. They have either ‘stolen’ or ‘lost’ an electron making them negatively charged and are searching to acquire another electron from a healthy cell to rebalance. This search usually results in spreading disease. The silver particles in colloidal silver contain a positive charge which attract them to virus, fungi, bacteria, pathogens and free radicals which all contain a negative charge. When the positive silver ions attach themselves to the negative charged particles in our bodies, they quickly disable the oxygen metabolism enzyme, suffocating and discharging (killing) the pathogens. The silver particles then release the pathogens and both are naturally flushed out of the body by the immune, lymphatic, and elimination systems. As with most homeopathic products, the smaller the parts per million (ppm) the more effective the product. Silver Water is an ionic silver solution at 5 ppm, which easily allows the silver ions to permeate the cell wall for maximum healing effects. All medical references indicate a larger ppm are not as effective. This small particle size also allows it to go directly into the blood stream bypassing the gut giving little chance of killing friendly bacterial. Humans, animals, and even plants will not develop a tolerance to colloidal Silver Water nor become immune to its healing properties. It is not possible to overdose on Silver Water and you can take as much as you feel you need. What is not used to kill pathogens is flushed out the body. Just 2oz is extremely effective. Taking two doses or applications 45 minutes apart has been found to have a 99% kill rate for disease. Silver Water is safe for pregnant and nursing women. It is odorless and harmless to the eyes, human enzymes, and healthy tissues. It does not adversely affect other medications you may be taking. It can improve digestion, reduce inflammation, and strengthen the immune system. It also aids in the regeneration of damaged cells and tissues. It destroys pathogens, free radicals, and helps to prevent colds, influenza, and other diseases caused by bacteria, virus, fungus or parasites. Unlike antiseptics, it does not destroy healthy tissue cells and may be safely applied to any part of the body, even the eyes. It is very effective for skin problems including acne, sunburn, or radiation burns. Why is our Silver Water so affordable?